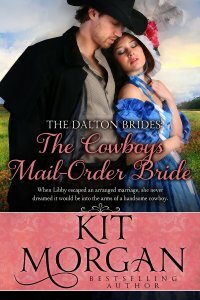 How can three sisters escape marriage to three old men? 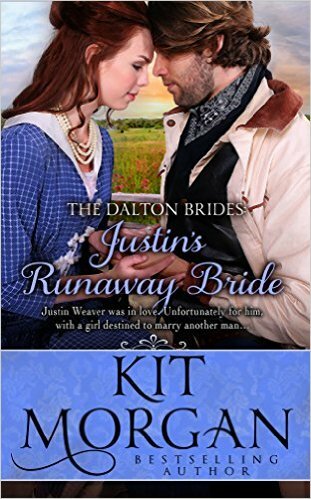 Run to Texas and marry three identical brothers! The Blue sisters are desperate. When terrible lies about Bonnie, Gwen and Libby are spread all over town, a scandal of epic proportions erupts. To save the family from further disgrace, their father promises them to three of the most lecherous old goats in Beckham, Massachusetts. 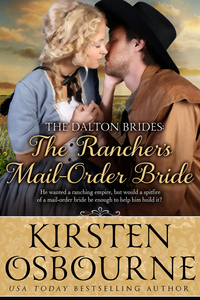 They would do anything to avoid such a miserable fate, including becoming mail order brides. Walton Dalton, the oldest of identical triplets, has dreams of building a ranching empire in north Texas. He’s claimed his land, but now he needs to convince his brothers to join him. He knows all he has to do is ask for their help and they’ll come, but are Nate and Bart as ready as Walt is to take a wife and settle down? Aw heck, what they don’t know won’t hurt ‘em! 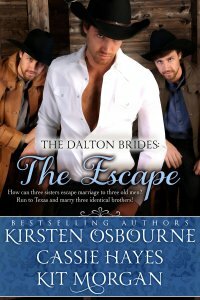 The Escape is the short prologue to three connected books by historical western romance authors Kirsten Osbourne, Cassie Hayes and Kit Morgan. Through no fault of her own, Gwen Blue found herself embroiled in a scandal that would set Beckham, Massachusetts on its ear, and get her locked in her room for two months. When she found herself betrothed to a man she found loathsome, she wanted nothing more than to disappear. When her sisters liberated her from her room and proposed a journey to Texas to visit an old school friend, she didn’t have to be asked twice. Walton Dalton always had a plan for his life. He’d spent years learning everything he needed to know about ranching, and he had a large parcel of land adjacent to his two brothers’ land. Between the three of them, they were going to build a Texas ranching empire. For his empire, he needed a bride. Without his brothers’ knowledge, Walt sends off for three mail order brides from a matchmaker in Beckham. He knows from the moment he sees ‘Gorgeous Gwen’ that she’s meant to be his. Will she agree to the marriage? If she does, will she be able to get over her self-centered attitude and be a good wife? Libby Blue lived in the shadow of her sister’s accomplishments. Bonnie, the oldest, excelled at all things domestic and was the smartest of the three. Gwen, the middle sister, excelled at … well, Gwen was beautiful, so she didn’t have to excel at much else. Libby tried as hard as she could to live up to both, but always seemed to fall short. But when Gwen is caught up in a major scandal, their father decides to marry Libby and her sisters off to the most un-eligible bachelors in Beckham to save the family’s reputation. Bonnie quickly devises a plan to escape their father’s wrath and sets it in motion. Libby might yet have a chance to prove herself! As a Mail-Order Bride! Walton Dalton had a dream to build an empire. Or in this case, a ranch where he and his two brothers, Nate and Bart, could work hard and love hard. Determined to see his dream come true, he sends for his brothers to join him in Texas to claim the land and begin building. That took care of the ‘work’ part. But Walton fails to tell them that he sent for mail-order brides to take care of the ‘loving’ part. Will Nate Dalton become Libby’s road to happiness? Or a slow path to misery because she still can’t measure up? He was a drifter, through and through. Could he give up his wanderlust for a mail-order bride he didn’t know was coming? Having grown up in the shadow of two beautiful sisters, ‘Scrawny Bonnie’ Blue knows she doesn’t stand a chance at landing a good man in Beckham, Massachusetts. 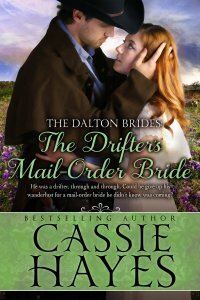 The only way she’ll find a husband is by leaving her family behind to become a mail order bride. But when all three Blue sisters are swept up in a scandal, she has no choice to but to take ‘Gorgeous Gwen’ and ‘Lovely Libby’ with her…kicking and screaming, if she must. Bart Dalton would be happy riding the range forever, but his brothers need his help to start a ranch in north Texas. He figures he’ll last a year or so before his feet get itchy again, which his brothers understand. As triplets, they can almost read each others’ minds. Except when his oldest brother ordered three brides for them. It would have been nice to have a little warning about that! When Bart’s late to meet the train carrying the Blue sisters, his brothers get first dibs, leaving Bonnie standing alone and dejected once again. It only gets worse when her ‘intended’ finally shows up and balks at the idea of marrying her. The one thing Bonnie has going for her are her wits, and she puts them to good use by proposing a business arrangement that Bart can’t refuse. Will Bart go back to his drifter ways, or is the elusive thing he’d searched for all his life sleeping in the next room? She’s a woman in need of a hero. Unfortunately, all she has is him. Growing up in an orphanage, Maggie Bishop learned to never depend on anyone — except her sister, Mary. When Mary disappears after becoming a mail-order bride, Maggie suspects foul play and desperately needs help. But there’s a problem: The one person she can trust is the one person she despises most. No woman in Beckham is immune to ‘Handsome Hank’ Blue’s considerable charms. Except for the beautiful, aloof and exasperating Maggie Bishop. The last time he spoke to her, he walked away with a handprint on his cheek! But Hank has bigger fish to fry. Nearly two years have passed since he vowed to discover the secret of the evil men who eventually ruined the family business, and he isn’t any closer now than he was back then. So when Maggie tells him they are at the center of her sister’s disappearance, he jumps at the chance to uncover their dastardly plot. As they search for her sister, Maggie discovers there’s more to Hank than just his pretty face and even prettier words. Only after Maggie is kidnapped does Hank realize there are more important things in life than vengeance. Will he rescue her before she’s lost forever or is he already too late? Adele Brown was always considered a nice girl, and bad things didn’t happen to nice girls, right? Unfortunately, “bad” found her, and chased her through the streets of Beckham, Massachusetts one night, and only because she’d been kidnapped, and then escaped! Fleeing to the one person who might help, she soon found herself on a train bound for Texas and the one man who could protect her from the evil that tried to claim her. The only problem was, he didn’t want anything to do with her. How was she going to survive without Percival Blue’s protection? Fortunately for her, he gave it, in name only, on a marriage certificate. The rest was up to her. How was she to convince him they could be more than a couple of names on a piece of paper before he insisted they get an annulment? With the help of his family, she was about to find out. From the tender age of seven, Lillian knew there was only one man she would ever love. Her love was intense and strong, and totally oblivious of the fact that the object of her attention didn’t care about her. Orphaned in her early twenties, she agreed to meet a man who was interested in marrying her, but realized she couldn’t. Her love was too strong. When she went to explain she couldn’t meet the man, she overheard something that turned her life upside down. When she was crying on the street, her only love, Benedict, came to her rescue, but made it clear he would only help her for a short time. Benedict was the oldest of three brother’s and the second child in a family of six. He’d always known what he wanted from life, and he knew how he was going to get there. When his parents’ reputation and their family mercantile were ruined by the three deacons who had tried to marry his sisters, he knew he had to find a new plan for his life. It couldn’t possibly include his childhood nemesis, Lillian, could it? Could he possibly make a fresh start with her? Could Lillian convince him that they were destined to be together forever? Millie Porter was a smart girl, a good girl, and a grown one. In fact, she was no longer a girl, but a woman of marriageable age. So why was she surprised when her parents made a promise to another prominent family that she’d wed their son? Maybe it was the fact they failed to tell her! Or worse, that she was nothing more than part of a business deal! Well, she’d just see about that!